From left to right are Julia Abbruzzese of Darien and Ridgefield, Kat Kern of Greenwich, Vivi Van Ingen of Darien (coxswain), Catherine Garrett of Darien, and Olivia Luther of Fairfield. 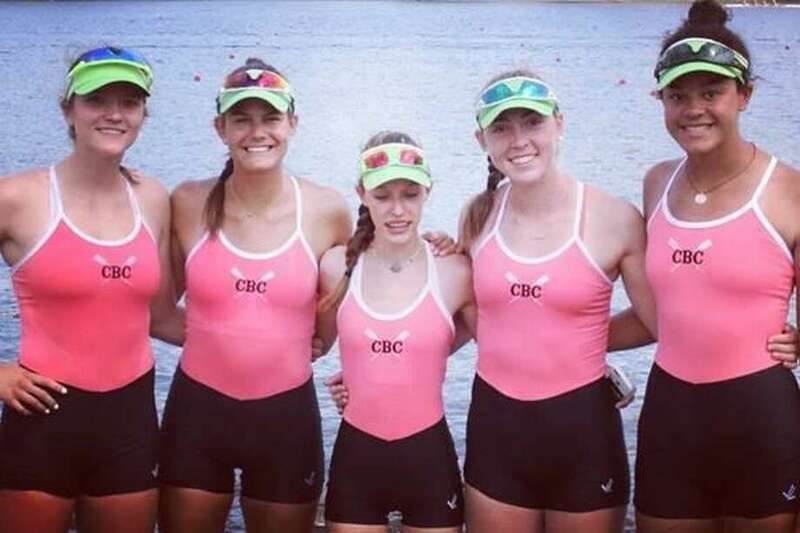 The Connecticut Boat Club took gold in the Women’s Youth 4+ at the 2018 USRowing Youth National Championships 2000-meter Lake Natoma course in Gold River, Calif., winning the race by over five seconds. The Northeast Region is one of the most difficult to qualify for because of the large number of high caliber teams. Attending the national championship is an honor because it is the highest level of rowing for high school athletes. Over one thousand of the nation’s most talented athletes from across the country competed in eighteen events for national titles and honors. CBC also qualified two additional boats for the championship and took fourth place in the Women’s Youth 4x (Ella Petreski of Pound Ridge, NY, Jenna Macrae of New Canaan, Ellie Urdang of Greenwich, and Bridget Galloway of Ridgefield) and sixth place in the Women’s Youth 2- (Casey Batson of Darien and Heidi Jacobson of Greenwich).